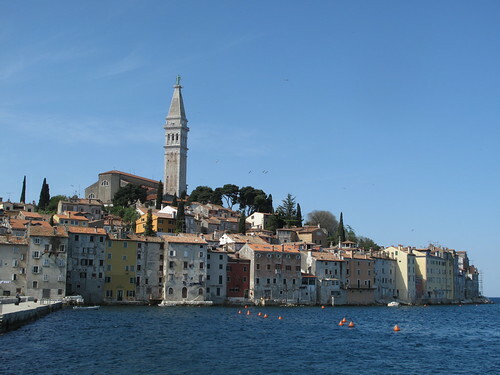 Whether you’re reading this in Zürich, Brugge, New York or Dubrovnik, I think we can all agree… the weather has been anything but predictable lately. We may have thought spring was on its way over here in Switzerland, but that quickly turned to cold temperatures, wind and rain once again. Where to go for a burst of color when it’s nothing but grey outside ? To the market, of course ! 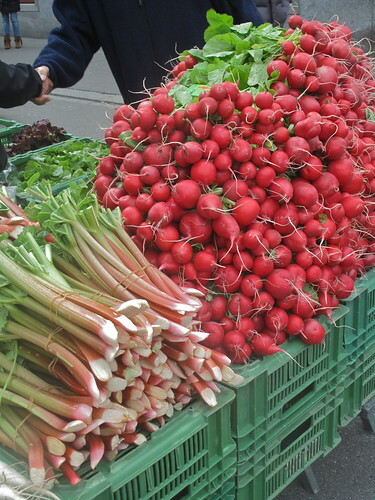 I love the markets in Zürich, especially at Bürkliplatz and Oerlikon, and am there at least once a week. The perfect start to my day. And whenever I travel, visiting the local markets is always a highlight. 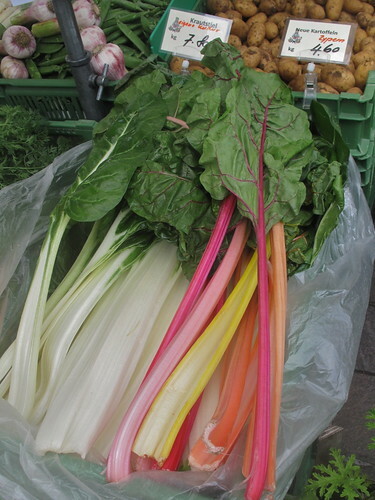 Before you head out with your market satchel or caddy, take a look at the monthly “What’s in Season” page by Jack and Silvia of Laughing Lemon, an excellent resource for seasonal produce in Switzerland. Sometimes it gets a bit confusing here, especially in recent months – when we saw pumpkins, strawberries and blood oranges all at the markets in March. So it’s good to know what’s worth waiting for, what won’t have much flavor anymore since the season is over and what you should grab right away. And it’s not just fruits and vegetables of all kinds and colors at the markets, but also breads, cheeses, meat, fish and flowers galore. What’s your favorite market ? 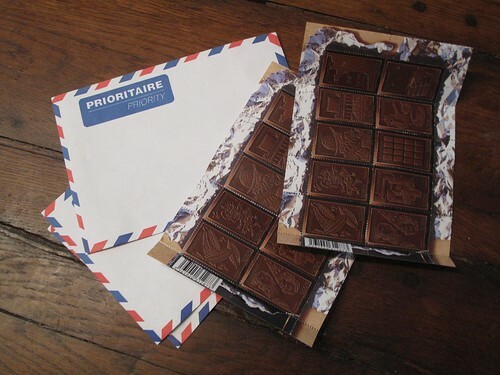 What do you make sure not to miss that’s in season *where you live* right now ? Did you see the hail earlier? And to think, now it’s perfectly sunny. I went to the Oerlikon market for the first time yesterday and absolutely loved it. I usually visit Burkliplatz or Helvtiaplatz, but Friday morning German class kept me away this week and since I needed my market fill I headed to Oerlikon, and I’m so glad I did, it was wonderful. I walked away with rhubarb and a grapefruit for marmalade, those long red radishes to pickle (a la David Lebovitz), some Castel Franco lettuce, some Mönchsbart, fava beans, fish and that wonderful fig-nut bread from the Käzig ladies (thanks for the tip via twitter, I love it, it’s like eating a fig newton, I wonder if they share their recipes). Great photos! And yes, love Jack’s ‘what’s in season’ page. I bought a bunch of monk’s beard from exactly that stand on Friday at Helvetiaplatz. cooked it up with olive oil, salt & pepper and lemon juice as told to by my Italian friend Francesca. Had my very first bite ever and it tasted just like grass. Odd. 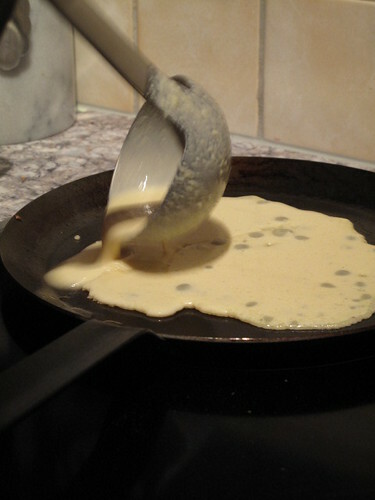 Must try again with butter, salt & pepper and garlic, which was what my friend Kim was insisting I should do. Beautiful stalls! Markets are wonderful. talley, I know, the weather is – in a word – wacky ! 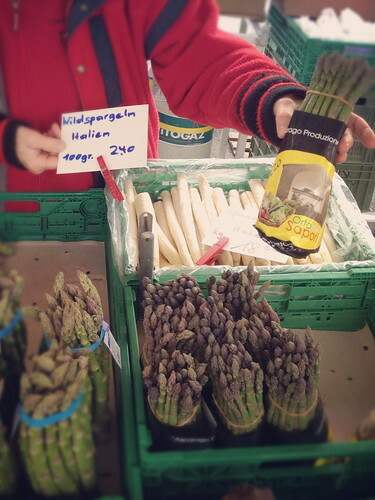 I was at the Oerlikon market yesterday too – it’s definitely the best in the area, I would say. And wow, that’s quite a seasonal assortment you got there. Must have been a very delicious weekend at your Haus ! 🙂 So glad you like the fig bread (oooh fig newtons ! ), it’s my fave – as you know. Next time you get it from the ladies above at Bürkliplatz, make sure you let them know I told you about it ! Katrin, mmm, grass. In all honesty, I’ve never tasted Monk’s Beard before. Can’t say I’m tempted now. 😉 I believe there was an article in today’s NZZ, with a recipe for pasta made with Barba di Frate and goat cheese. Check it out… Oh, and I totally agree about the prices. I did some seriously long comparison shopping/tasting when I first moved, and have stayed loyal ever since. no problem to find out what’s in season. we smell it from the windows. I forgot: besides the market: The chocolatier Müller makes not only these little chickens at easter time but the most delicious macarons.. I love shopping at the markets and try to do as much of my shopping there as I can. 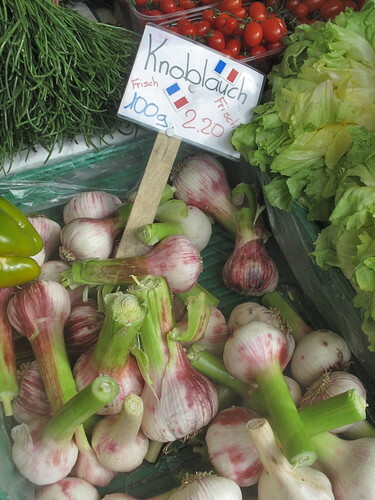 I often go to Bürkliplatz but also like the markets at Tessinerplatz in Enge which are close to my office. 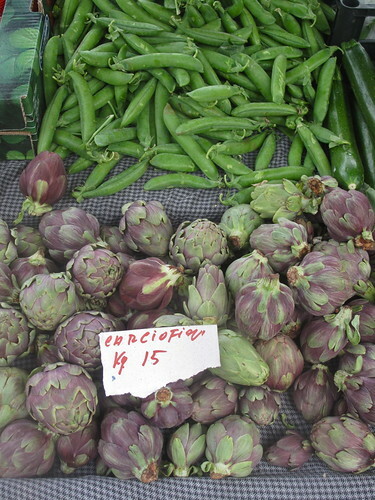 The Enge markets are on every Thursday from about lunch to around 7pm. It’s quite a small market but it’s worth checking out. Oh so pretty, not common items in an Israeli souk, especially not the colored eggs (did I read here that they can be found all year?). 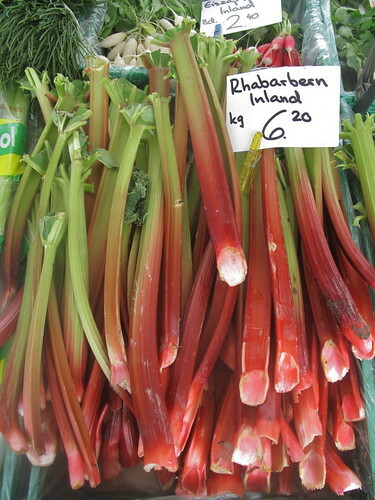 I have finally seen rhubarb sold at the Carmel Market in Tel Aviv, a lovely addition to the piles of tomatoes and cucumbers. As someone who loves absolutely loves Berkliplatz this report captures the feeling there perfectly! A great article to send to friends in Australia. Gorgeous. 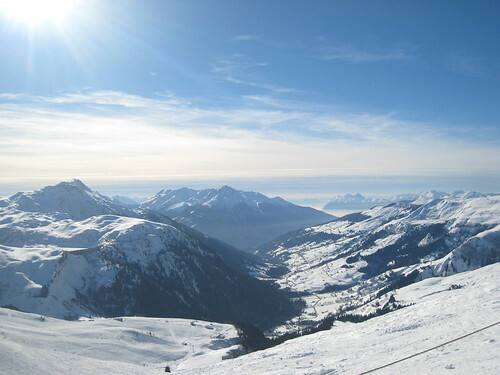 Brings back happy memories of my times in beautiful Switzerland. I just love those hyacinths! Urs, how fabulous ! 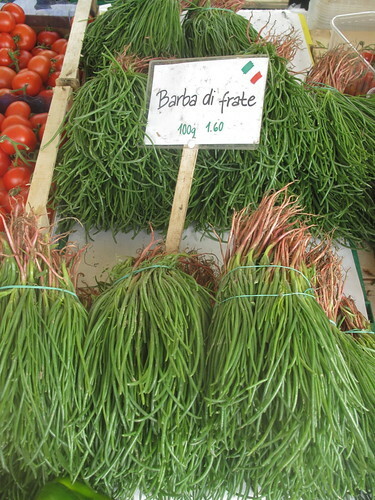 A wonderfully aromatic and delicious market just outside your door ! 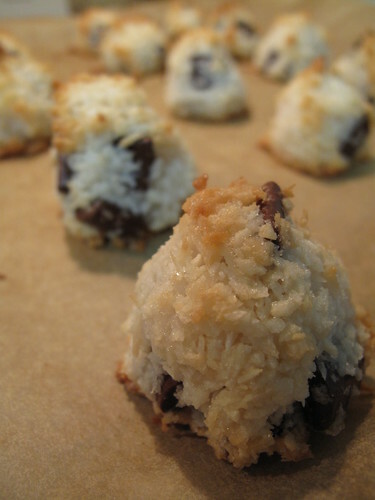 As for Thomas Müller, I am familiar with his wide assortment of (divine) chocolates, but have never tasted his macarons. I will have to change that, thanks for the sweet tip. Thanh, good to know about the Enge markets, especially if anyone should sleep late ! 😉 I’ll have to check it out for sure, thanks ! Anne, thank you ! 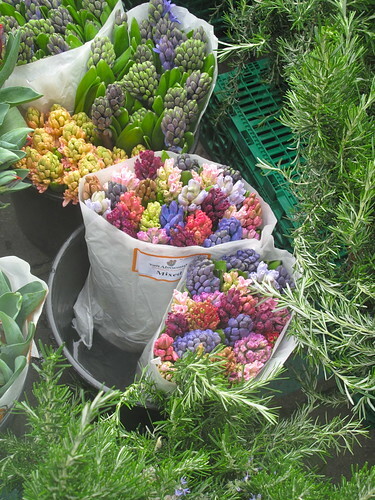 I loved those colorful hyacinths too ! 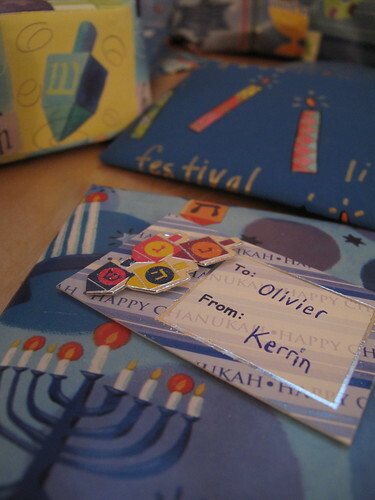 Thanks for the mention Kerrin… We must meet at the market again sometime soon! I miss living in Notting Hill as Portobello market was my local. It was always great fun going down for the weekly shopping. Early enough to avoid the crowds, and be full of choices. 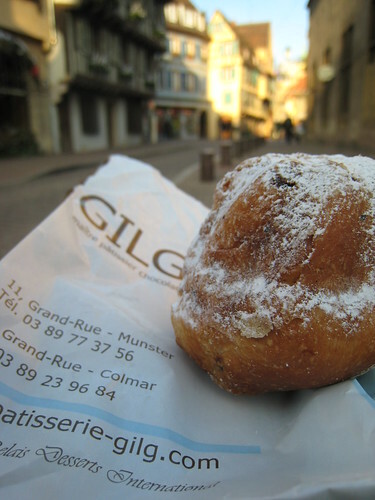 When I travel to France I am always vey excited to go down to their local markets as its without fail a great adventure. 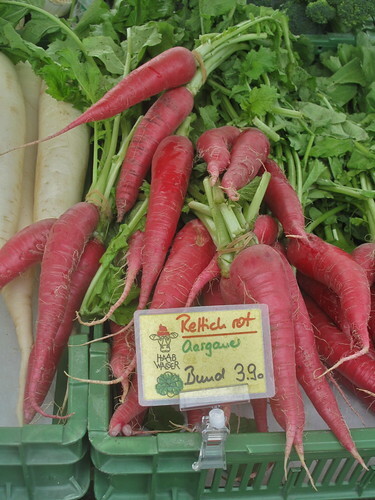 The organic farmers market is held once a week (Saturday) in Budapest. That is a heavenly place on Earth! 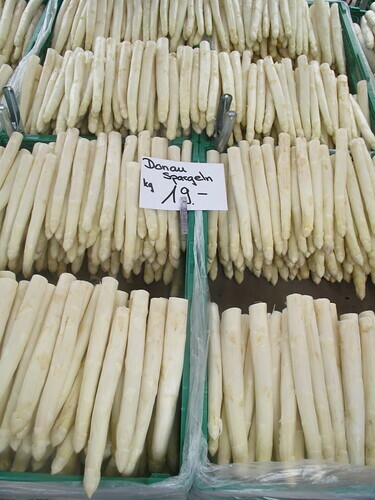 🙂 Asparagus (green & white), wild mushroom, spring onion, ramp (wild garlic), new carrot, rhubarb are in season now in Hungary. Oh tu as rammené des renoncules, mes fleurs préférées!!!! Toujours fan des oeufs de couleur!!! Emma, you know I thought of you with this market post ! Snow and potatoes ? Could be worse. 😉 Hey, make Rösti and pretend you’re in Switzerland, haha ! Valentina, Notting Hill’s such a great London neighborhood; I bet that Portobello market is fabulous. 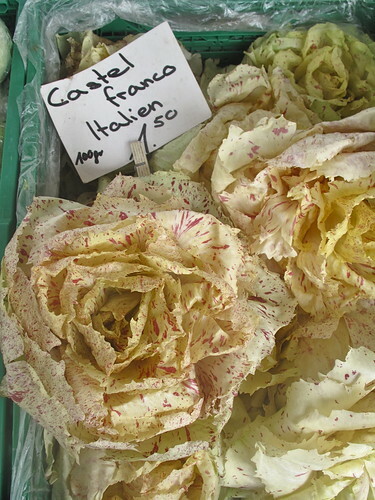 And I’m with you – always go to the markets in France, j’adore ! 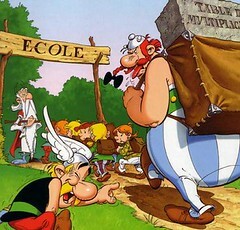 stéphanie, j’en acheterai encore plus pour toi la prochaine fois ! Bisous colorés de Zürich à toi et Naïs ! 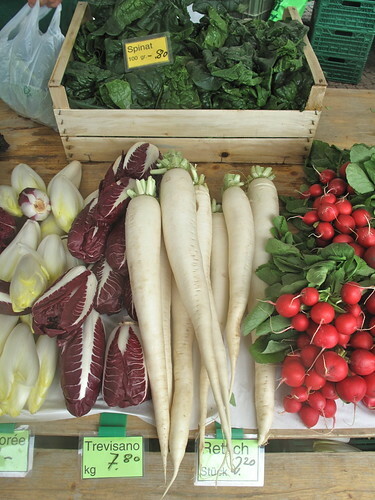 Let’s meet up sometime; an early morning visit to the market in Oerlikon is one of my (few) weekly routines; can’t have a weekend without a Kamutzopf (braided kamut flour bread) from Dolderer Franz Holzofenbäckerei 🙂 And of course all the seasonal veggies und fruit. 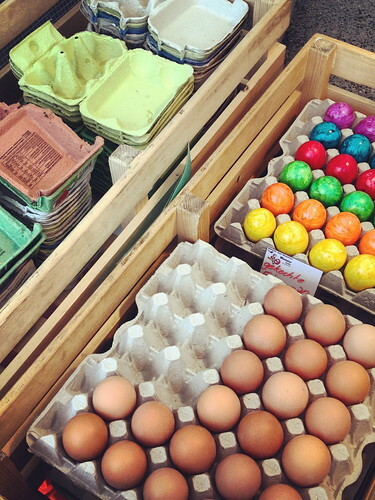 I just adore your colourful market pics Kerrin. Thank-you. It’s such fun comparing what’s in Spring season there with our own Aussie autumn produce here. Without having to get on a plane for 24hours. If only we could grow tulips like those in sub-tropical Queensland. 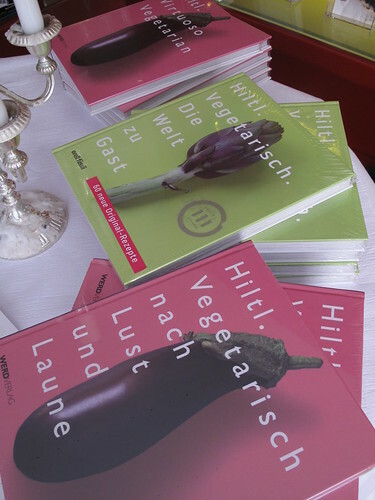 I want to start a blog myself but at first in german and I find your blog incredibly inspiring. Stylish website, beautiful illustrations and pictures and very good and interesting blog entries too. Love it! Marlen, hi ! A morning meet-up at the market sounds fabulous. 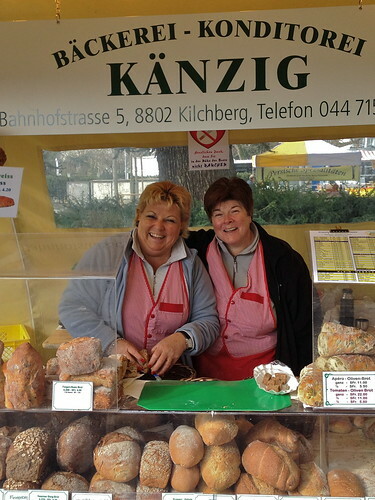 A must for this spring when I’m back from my travels… and I’ll have to try that Kamutzopf for sure ! Susie, thank YOU. I love comparing what’s in season at markets around the world too. So what’s in season right now where YOU live ?? Oh Kerrin, how could I have missed this delightful post?! I don’t know…. 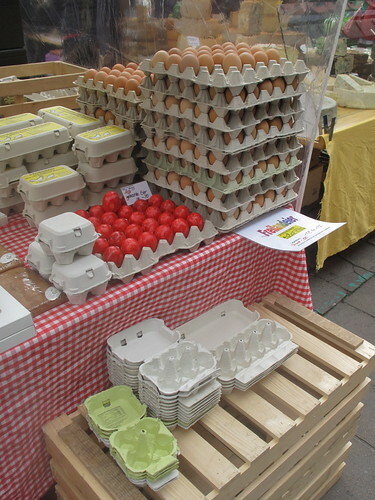 My favourite market is always the one of the place I live at the moment…. sounds stupid but it’s so true. 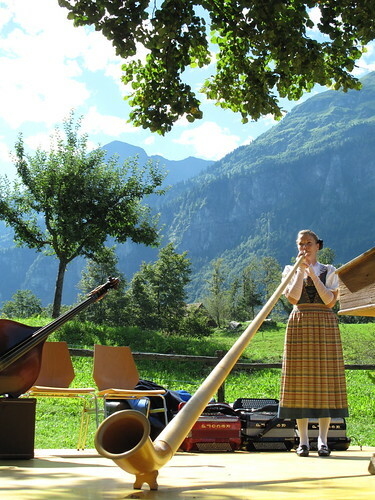 I absolutely ADORED the Bürkli-Märt which I visited at least once a week while I worked in Zürich, then, in England, I went faithfully to the weekly market in Totnes and found all my goodies there. 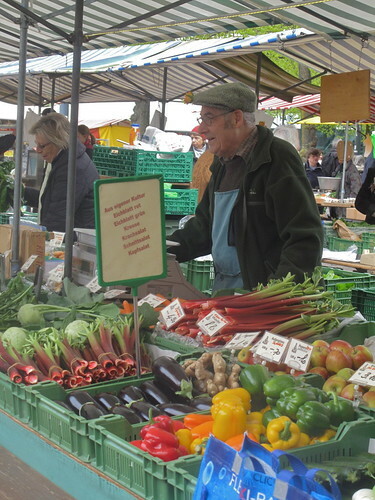 Back in Switzerland, in Lutry, we had this delicious and varied market on Saturday mornings with not only fresh veggies and fruits but cheeses, honey, bread, socks and rubbish from afar. 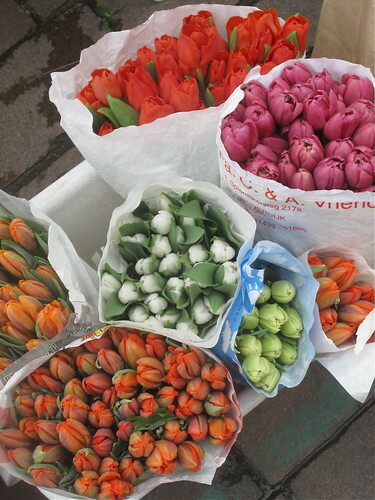 Not to forget the rich varieties of flowers, shrubs, jewellery, yoghurts, knitting and what-not’s…. It was always a great experience to pop out of the house and see what was on sale. 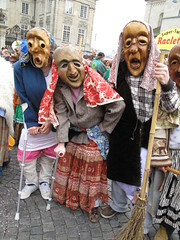 Thank you for ‘my’ Bürkli-Märt… great joy! Yesterday I picked baskets full of glorious ruby red grapefruit, basil, chilli, lemons and navel oranges. Take a little look – //www.wekaweka.com/my-farm-kitchen-blog/2012/5/2/a-new-pie-matt-golinski-bits.html It’s going to be a very busy week preserving all this loveliness. We also visit our local Gold Coast Farmers Markets at Palm Beach each Saturday AM. Plenty of authentic organic growers with top quality produce there. 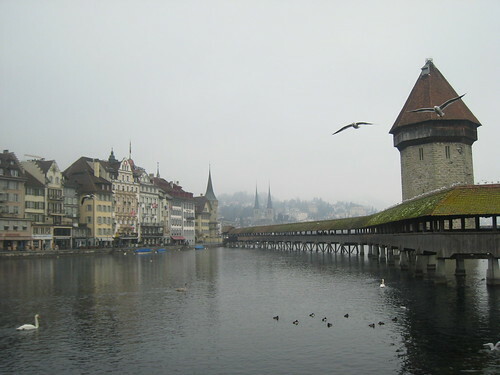 I miss Swiss markets! Wonderful! Great pictures! !